Winter comes with plenty of potential perils for your pet, from falling through ice on a frozen pond to being poisoned by antifreeze. Following our top tips should help you keep your pet fit and healthy throughout this colder period. Antifreeze may be great for car owners to keep their motors running when the temperature plummets, but it is fatal when ingested by dogs. Prevent your pet from drinking from roadside puddles as these are often contaminated with antifreeze. Antifreeze (ethylene glycol) is sweet and therefore very appealing to dogs. There is an antidote (IV ethanol), but it must be given immediately otherwise the effects are likely to be fatal. Unfortunately antifreeze is an extremely common fatal poison. If you suspect your pet has drunk some antifreeze, it is important to get them to the vet asap. Do not wait for symptoms. Rock salt is a mixture of salt (sodium chloride) and grit used to prevent roads becoming icy during the winter. Rock salt poisoning usually occurs in pets such as dogs and cats when they lick it from their paws or fur when they return home. Eating rock salt results in a high blood sodium concentration. This can cause thirst, vomiting and lethargy, and in severe cases, convulsions and kidney damage. Seek veterinary advice immediately. Wipe their paws before they come inside to remove any salt or antifreeze residue and prevent them licking this off their paws. This will also help warm their paws. When it is freezing outside your pets – especially cats – seek warm spots to snooze in your house, such as radiators, open fires or wood burning stoves. However, these spots can pose burn risks for pets who are unaware of exactly how hot these heat sources can get. During the cold winter months restrict access to these heat sources to prevent your pets burning themselves. Snow: In snowy weather, check your dog’s paws and dry them when they come in from the snow. Snow can compact between their toes and turn into ice balls which causes your pet pain. Remove these balls and trim the hair between your dog’s toes to reduce this happening. Cracked Paws: For cracked paw pads, use a pet moisturiser to soothe your dog’s skin. You might need to distract your pet with a treat, so they aren’t tempted to lick it off immediately. Booties: To prevent cracked pads in winter, try putting your dog in booties. Clean routine: Otherwise clean his paws every time he comes inside. Dogs can suffer from dry skin conditions just as we can. Take extra care of their skin during the cold winter months to prevent discomfort. Don’t cut out baths altogether during the colder months, but do decrease the number of baths your pet takes to prevent their skin from drying out. You could also invest in an extra moisturising pet shampoo. If your dog is shivering and seems cold, cover him with a towel or blanket. You can use a gentle heat source such as a hair dryer on a lowest setting, but avoid heating his paw pads, as they could burn. You can also use a wheat bag, but be extremely careful with these ( click here to read our article on the dangers of wheat bags and how to use them correctly). Check the temperature against your wrist to ensure it’s not too hot. 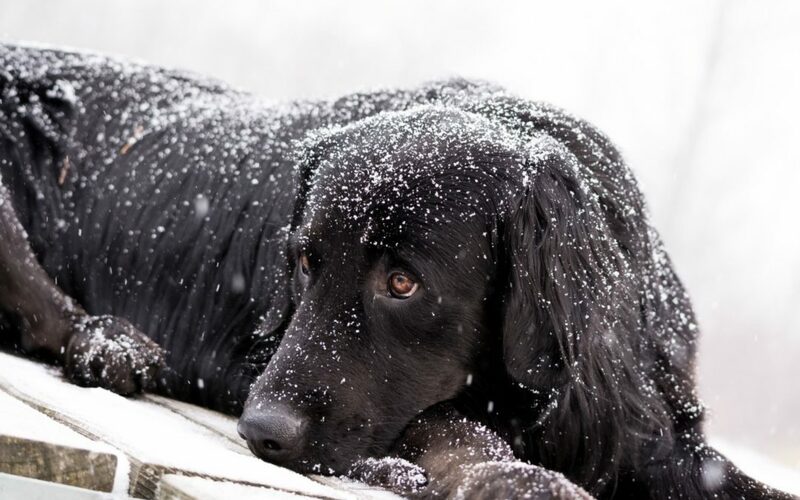 If your dog gets cold easily, invest in dog coats, jumpers and booties but remember though even a cosy coat can’t prevent frostbite on the feet, tails or ears. Good to know: as a general rule if it is too cold for you in your winter coat, it is too cold for your dog. Keep a dog blanket in the car for a quick warm up. Just as you should never leave a dog alone in a car in the hot summer, you should never leave a dog alone in a car in winter. Freezing cold temperatures are equally as dangerous for him. Leaving the car engine running while you clear snow etc could lead to carbon monoxide poisoning if you have a blocked exhaust. There is no reason not to continue exercising in winter. If conditions are particularly icy and cold you may want to reduce outdoor exercise. However as long as your dog is gradually introduced to the cold weather and is well adjusted to it, its good for them to get outside. Keep your dog’s coat warm and dry after walks. If your dog is reluctant to go outside in the cold, keep them active and engaged indoors and adjust their calorie intake accordingly so avoid them becoming overweight. Keep your dog on a lead during the icy months, in case they run onto thin ice or a partially frozen pond and get into difficulties. They may also be tempted to jump into an icy river. Your pet also needs good recall so they don’t get lost in the dark. Make sure that in dark, foggy or snowy conditions your dog can be seen by drivers and pedestrians to prevent road accidents. Attach a small light to his lead or wear a reflective coat. Just as in summer, make sure your pet has sufficient fresh water that is frequently refreshed. First Aid for Pets provides this information for guidance and it is not in any way a substitute for veterinary advice. The author does not accept any liability or responsibility for any inaccuracies or for any mistreatment or misdiagnosis of any person or animal, however caused. It is strongly advised that you attend a practical First Aid for Pets course to understand what to do in a medical emergency.